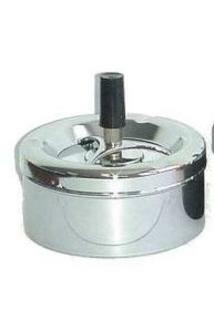 Choose from our range of fixed and spinning ashtrays for personal or commercial use. Ashtrays for those who need to keep their personal cigarette ash to themselves. Includes both small and keyring sizes. 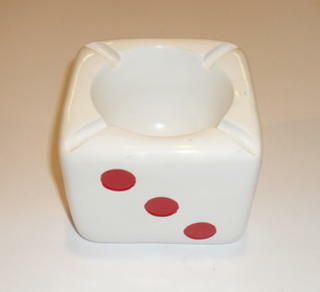 Cubic acrylic dice ashtray 100mm cube with red dots on white. 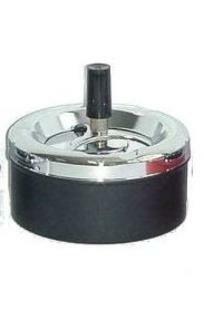 Open ashtray in high polish chrome with heavy rubber tracked tyre that revolves without friction on a pseudo disc pad with logoed callipers. 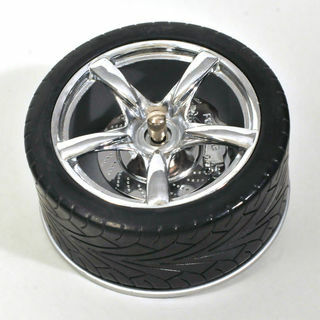 Tyre and pseudo alloys lift off to empty cast aluminium base of ash and butts. Or use it as a desk paperweight - very cool toy. Aztec brand code 950, 11cm diameter, round, metal spinning ashtray with all black, powder coated finish, 5cm deep, metal base and featuring a polished chrome metal removable top with black acrylic push button. 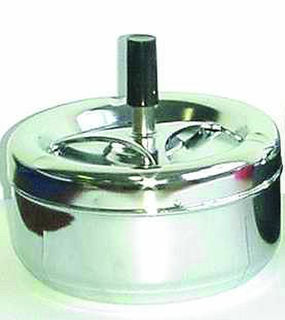 Aztec brand, 12cm diameter, round, metal spinning ashtray with polished chrome finish. 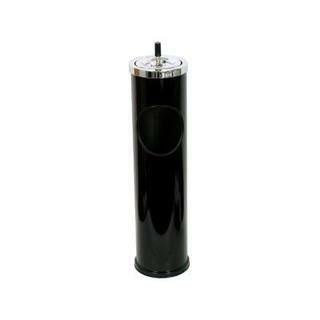 Removable top featuring black acrylic knob, 5cm deep base featuring black leatherette band. 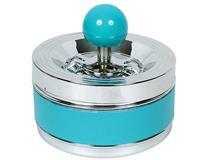 Removable top featuring blue acrylic knob, 5cm deep base featuring blue leatherette band. Removable top featuring pink acrylic knob, 5cm deep base featuring pink leatherette band. 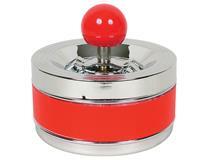 Removable top featuring red acrylic knob, 5cm deep base featuring red leatherette band. 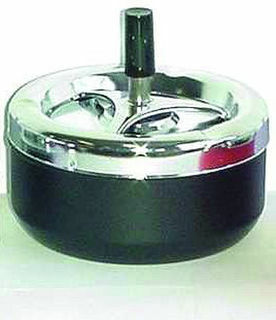 Aztec brand code 955, 13cm diameter, round, metal spinning ashtray with all polished chrome finish, 6cm deep base and featuring a polished chrome metal removable top with black acrylic push button. Aztec brand code 955, 13cm diameter, round, metal spinning ashtray with all black, powder coated finish, 6cm deep, metal base and featuring a polished chrome metal removable top with black acrylic push button. 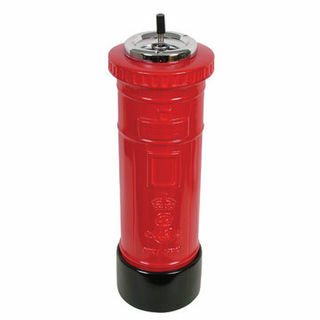 Flick your ash or butts on the top and press down the top ball to spin them safely away into the base. 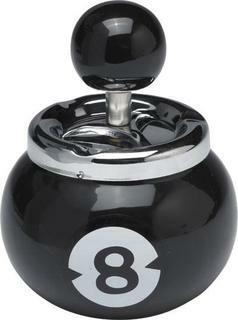 Round snooker 8-ball shape ashtray. 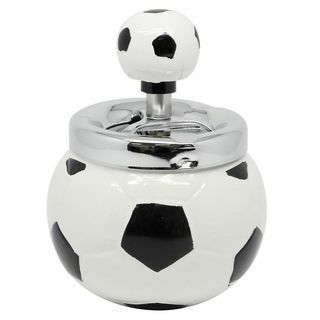 Round soccer ball shape ashtray. 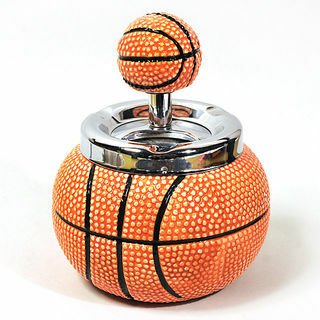 4" diameter round basketball shape ashtray. Supplied collapsed in a cardboard box. 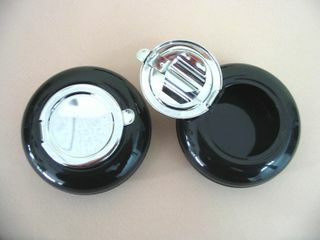 Standing Ashtray & Trash Can - Black 60cm high. Ashtray 13cm diameter, round, metal with all polished chrome finish, 6cm deep base and featuring a polished chrome metal removable top with black acrylic push button. Side opening, as shown, to allow trash to be thrown into internal removable basket. Flick your ash or butts on the top and drop safely away into the covered base to help avoid odour. 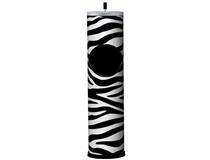 Standing Ashtray & Trash Can - Zebra 60cm high. 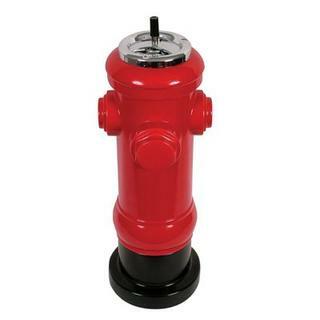 Spectacular free standing ashtray on red fire hydrant 60cm high overall. Ashtray is 13cm diameter, round, metal with all polished chrome finish, 6cm deep base and featuring a polished chrome metal removable top with black acrylic push button. Spectacular free standing ashtray on red mail box 60cm high overall. 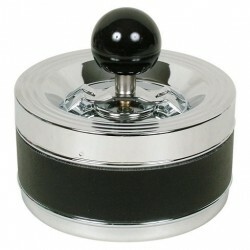 Ashtray, 13cm diameter, round, metal with all polished chrome finish, 6cm deep base and featuring a polished chrome metal removable top with black acrylic push button. 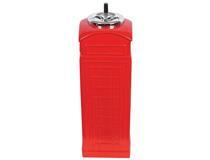 Spectacular free standing ashtray on red telephone box 60cm high overall.